(From Nikon lens literature) With its 114 degree picture angle and f/2.8 fast aperture, this lens offers a dramatic angle of view in demanding situations. Extra Low Dispersion glass and two Aspheric lens elements ensure superior image quality and compact design. Built-in rear filter holder accepts gelatin filters. 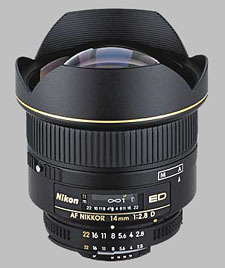 Nikon 14mm is very amzing lens Prime wide-angle perspective and fast f/1.8 aperture delivers great low-light performance.Quiet focusing with built-in Silent Wave Motor (SWM). gps monitoring systemRear Focus (RF) provides smooth and fast autofocus while eliminating front barrel rotation and lens length changes.it will give Very good result. Central to foreground sharpness and zero window glare problems. can't protect it with a filter and some moustache distortion. This lens may be a soft out on the corners at full aperture for sharpness but it more than makes up for it with central and foreground sharpness which astounds me no end, and it is only when pixilation become an issue with my D700 camera sensor image quality becomes an issue. I usually avoid having round objects like clocks on a wall or cups on a coffee table in the corners of the image for such ultrawide lenses because they become strangely elongulated so I rarely have anything much worthwhile in the corners anyway and place the more important elements of the image closer to the centre of the image which is where the sharpness of this lens is untouchable. When shooting with this lens I usually have it set for f8 to f11 and never below f5.6 because I only use such lenses to maximize the depth of field. No perceptable window glare is another strong point in this lens which is a big issue with my 20mm. I can shoot interior shots with this lens and there is none of that nasty halo around the windows at all and fine detail such as with leadlight window's leading was completely untroubled by the strong background light. This len when found under $1000 is still a fine performer and value. Gives sharp contrasty images as long as you watch where you point it avoiding light sources on the front element. Can still be used on your manual focus bodies from yesterday with it's aperture ring intact. Has been superseded by the excellent 14-24 f2.8 which is quite sharp out to the corners so if price is not an issue go for it. This lens doesn't have any reason to exist anymore. The same priced Nikon 14-24 beat it hands down. Go for the 14-24 zoom! Contrary to some of the reviews that I've seen I'm fairly satisfied with this lens. It has very good color and contrast, sharpness is acceptable and f2.8 but gets much sharper as you stop down.